A common winter visitor to the state, the Lapland Longspur summers and breeds in the Arctic Tundra. They can often be found in conjunction with Horned Larks in the state as they forage in open fields and pastures. Winter flocks can number in the thousands. Habitat: Prefers open country in winter, including farm fields, pastures, grasslands, and beaches. It summers on the Arctic tundra. Diet: Winter diet in South Dakota is primarily seeds and waste grain. Summer diet includes seeds but also many insects and spiders. 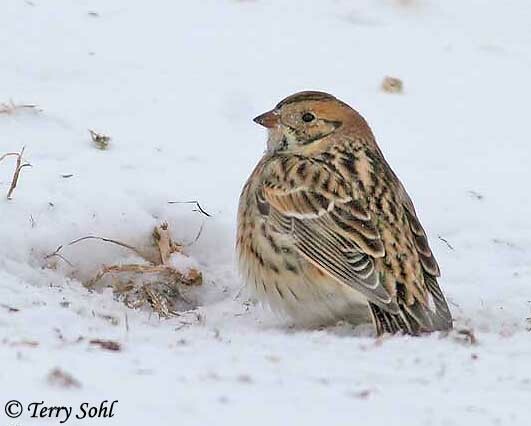 Behavior: Very gregarious except while nesting, Lapland Longspurs often forage in flocks numbering in the thousands. They primarily forage by walking along the ground. 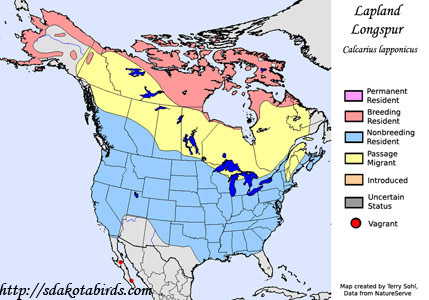 Migration: Winters throughout much of the continental United States. Summers in extreme northern Canada and Alaska. Conservation Status: Abundant and widespread. Summer breeding range is remote and generally free of human disturbance. Additional Photos: Click on the image chips or text links below for additional, higher-resolution Lapland Longspur photos. South Dakota Status: Common migrant and winter visitor statewide.